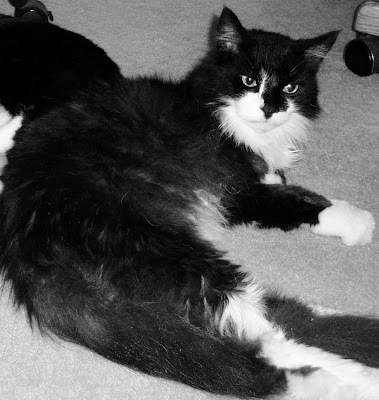 Today we said goodbye to Minx the Magnificent, our beloved, long-haired, black and white cat. Overcoming kidney failure, high blood pressure, and his own appalling standards of personal hygiene, it was cancer that finally got him. We thank Dr. Baker for all her hard work over the last few weeks, and Dr. Weiss, Liz the tech and everyone at Allandale Veterinary Clinic for guiding him (and us) through his last moments. He is survived by Doobey, Gris-gris and Possum, and joins Mercury (whom he never met but with whom he shared many common traits) in both the family plot at the bottom of our lawn, and the lush, sun-filled garden in the sky. A desert willow will be planted in his honor. Minx strayed onto our back porch in the summer of 2005, emaciated, bedraggled and covered with sores. After careful nurturing and much love, he grew to be a large, healthy cat, encouraging neighbors to suggest that, "If you saddle him up, you could ride him to work." The vet thought he was already 8 or 9 years old which means he was perhaps 16 or 17 years old at the end. The vet also told us that Minx was a boy; after nearly 10 months on our porch, we had still been unable to see his naughty bits. We saw them many times, and from many angles, in the years that followed. Minx was in fact, "all male" and regularly turfed our female cats off their favorite seats, just to prove he could. He brooked no nonsense from the ladies, and though he occasionally snuggled up with Doobey on cold winter nights, he'd as soon chase her into the next-door neighbor's yard for no apparent reason. Minx was almost completely blind with many cataracts, and to quote my mother, he was "as deaf as a post," yet he could hear a tin of Fancy Feast Chicken Dinner (Shredded) being opened from a mile down Shoal Creek. His few and irregular teeth caused him great difficulty in eating crunchy food but gave him an award-worthy Elvis sneer. Minx had splendid, monster-size front paws which brought gasps from admiring humans but which he never once used to bury his poo. His infamous toilet habits will go down in the annals of Nason Payne family history. He liked to stand in the cat litter and poo over the side on to the floor. If he ever poo'ed in the box, it was a coincidence. The purchase of a bigger cat litter box made no difference: he merely widened his stance within it. On occasion, he didn't bother getting in it at all, simply standing close by it. Towards the end, he pee'ed near the box or on any convenient newspaper. This was good enough for him. He never took advice on the subject; other people's opinions didn't matter to him. He had no fondness for medication of any kind and was notorious for his dislike of taking pills. He is the Guinness World Record Holder for "Appearing to have swallowed a tablet when in fact, it's hidden in his cheek all along." His drug of choice was catnip and he was well-known in our household for the gallons of drool he produced when sucking the catnip mouse. He also ate every catnip plant we ever tried to grow before we could get it out of the pot and into the soil. We will miss tickling his curly white-furred belly. We will miss his trying to get the glass doors open with his nails. We will miss his loud, multi-octave purring. I will miss him walking by outside my office window to the front of the house in hopes that mewing at a different door might mean a better chance of more food. Doobey forgives him for the many face-swipes and discourteous shoving off her seat; she'll miss his random snuggles. Gris-gris is still trying to forgive his arrival in our back-yard. Possum says, "What? Who?" His human family thanks God, the Universe and the Powers-that-be for bringing him to us. I doubt that it's possible but we hope we gave him as much joy as he gave us. May his spirit always live within and around us. Bernadette, I'm so sorry for your loss...Minx sounds like a very fine kitty and I am glad you have so many fond memories to share...he is no doubt scampering and leaping about in Heaven with the other much loved kitties, my Foo Foo and Kitty and he are probably best buds, or is that "chums"?